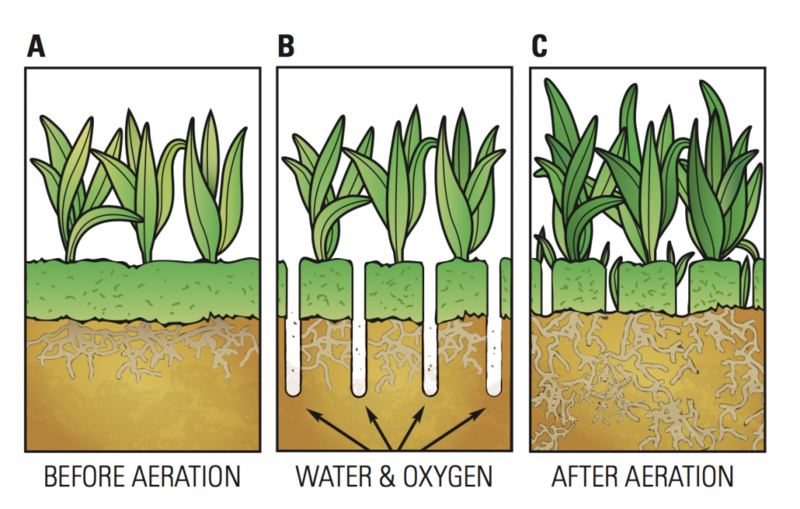 Aeration is the process of punching holes (up to three inches) into your lawn. Commonly, it is the most important part of lawn care in Colorado Springs, especially because of our cities’ dry climate. The lawns that benefit the most from aeration are lawns that are high-traffic and have compact soil, or lawns that were established by importing sod. However, all lawns can benefit from this practice. Allows for Oxygen Circulation The holes in the ground will allow for the proper circulation of air to reach your grasses’ foundation. Better Water Absorption Aeration allows normal watering practices to have more affect on your lawn health. The water is better able to be absorbed by the roots of your grass. Easier Access to Fertilizer Combined with a proper fertilizer, administered by an experienced lawn technician, aeration provides your grass’ roots with quick access to the nutrients in the fertilizer. This will allow your grass’ roots to grow stronger and deeper. Eliminates Thatch Layers of dead vegetation that are compacted on the surface of your lawn. This layer is often harmful to your lawn as it prevents your grass from getting the nutrients it needs for a strong root. You can aerate your lawn once or twice a year depending on need— once in the spring and/or once in the fall. Since each lawn is unique, consult a lawn care technician for more advice on what the best practice for your lawn would be. Wayne Russell Lawn Care uses years of experience and knowledge, alongside professional-grade equipment, in order to achieve the greenest lawn in the most efficient way – saving you time, money and backache! Water your lawn a day or two in advance to soften the top layers of soil. If applicable, mark all of your sprinklers to prevent any damaged property. Your professional lawn care technician will typically need 15-30 minutes of work time for an average lawn. Aeration works best when combined with other lawn care services. Warning!!! Hiring Wayne Russell Lawn Care LLC may cause a dramatic increase in the green of your lawn, leading to increased neighbor envy. Don’t say we didn’t warn you!